Franklin Barreto hit a pair of home runs and Kendall Graveman put together a solid outing in the Nashville Sounds' 8-2 win over the Memphis Redbirds in front of a sellout crowd of 10,712 Sunday afternoon at First Tennessee Park. Trailing 1-0 in the bottom of the third, Barreto lined a two-out, two-run single to left field to give the Sounds a 2-1 lead. Anthony Garcia pitched in and followed with a run-scoring base hit to extend the lead to 3-1. The Sounds never trailed again as the offense kept churning while Graveman held down Memphis. The right-hander allowed two runs over 6 1/3 innings and picked up his first win of the season. Barreto's huge game continued when he drilled a two-run home run into the left field seats in the bottom of the fifth. Memphis trimmed the Nashville lead to 5-2 in the seventh, but Barreto was at it again in the eighth when he launched a solo homer to center field. The multi-homer game was the fifth of his career and the five RBI matched a career-high. Josh Phegley added a pair of insurance runs with a two-run blast of his own in the eighth. Emilio Pagan worked 1 2/3 scoreless innings in relief, and Josh Lucas pitched a perfect ninth to lock down the win. The four-game series concludes Monday afternoon at First Tennessee Park. Left-hander Eric Jokisch (0-4, 4.88) starts for the Sounds against right-hander Daniel Poncedeleon (1-2, 2.39) starts for the Redbirds. First pitch is scheduled for 12:05 p.m.
With today's 8-2 win, the Sounds improved their record to 15-14 on the season. Today's attendance of 10,712 was the fourth sellout of the season at First Tennessee Park, and 59th in ballpark history. Today's win clinched a series win against the Redbirds. 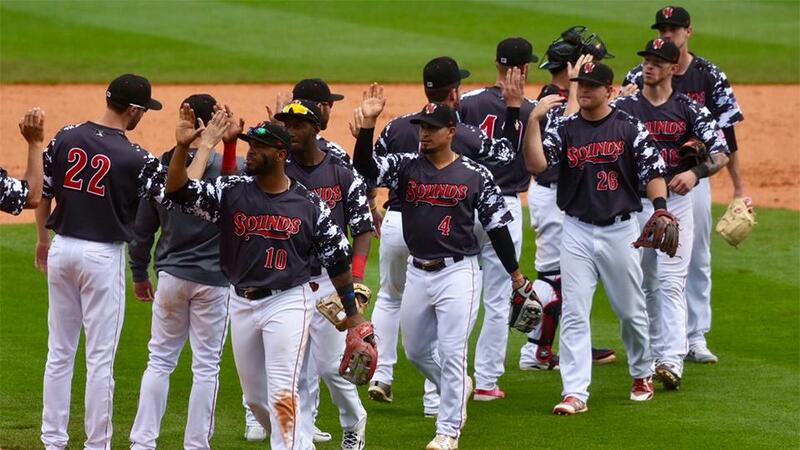 The Sounds have won five series and dropped three. They'll go for the four-game sweep tomorrow afternoon. With nine more innings of errorless baseball this afternoon, the Sounds have now played 42 consecutive innings without an error. The team has committed just one error over the last seven games. Left fielder Nick Martini extended his consecutive on-base streak to 18 games when he walked in the third inning. Since April 14, Martini has reached safely in every game he has played in. Second baseman Franklin Barreto matched a career-high with five RBI with a two-run single in the third, and a two-run homer in the fifth, and a solo home run in the eighth. Barreto's multi-homer game was the fifth of his career.